Our data was sourced first through Crunchbase, then cross-referenced with press releases. Obviously, it is not perfect. If you spot an error or something we’ve missed, shoot an email to kalie@datapine.com and we promise to check it out. The number of companies funded in Berlin was almost evenly distributed across both quarters. 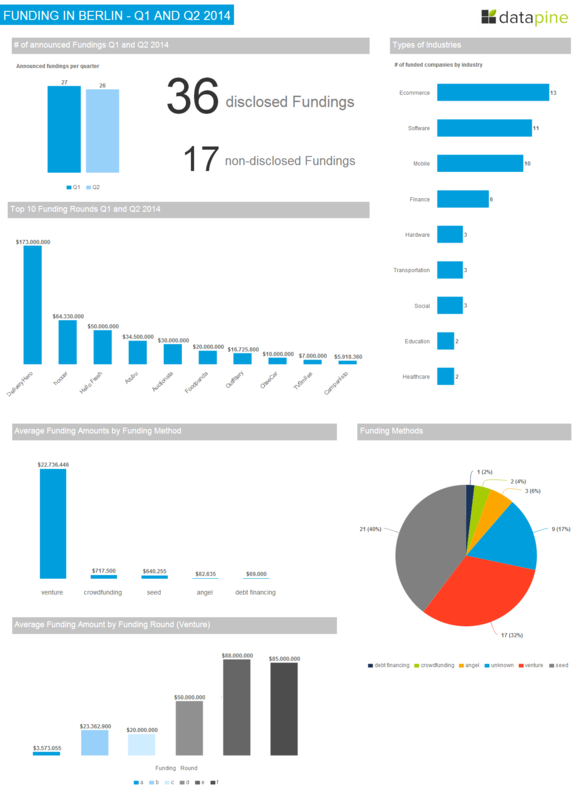 Twenty-seven Berlin startups announced funding in Q1, and twenty-six in Q2. Per usual in Germany, many companies chose not to disclose the exact number of their round. 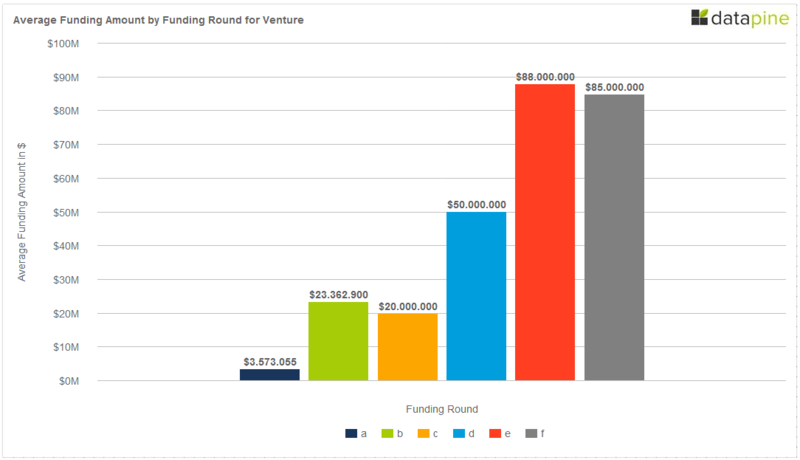 Thirty-six startups disclosed funding; seventeen did not. Of companies that did not provide a specific number, Lesara, Coffee Circle, Ezeep, Amorelie and GoEuro reported funding in the seven digits. Startups Niiu, Flowkey and akvolution raised six digit rounds. As is standard in Berlin, most of the funded companies (13) are e-commerce related. 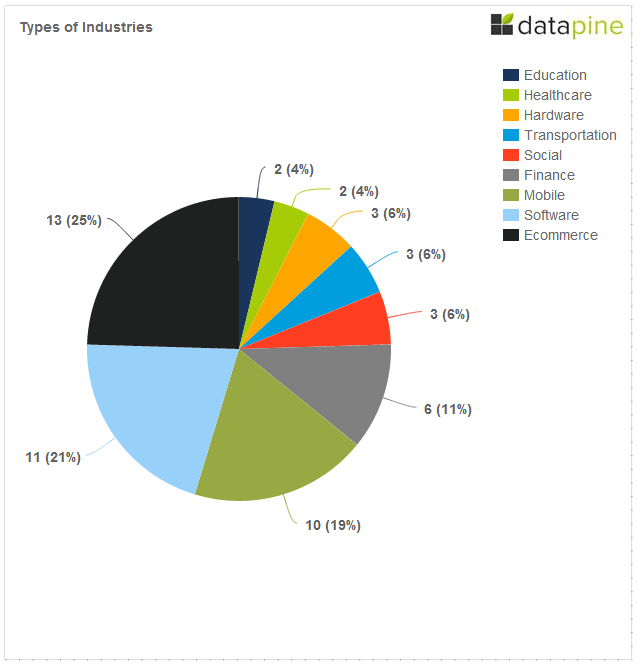 The industry was closely followed by both software (11) and mobile (10). In line with global startup trends, finance accounted for 6 companies, hardware and transportation for three each. The list was rounded out by by social (3), education (2), and healthcare (2). Berlin has seen strong early-stage funding and deal activity – a good first step toward a healthy ecosystem. While we realize seed funding is part of venture capital, we separated out Series A and above for a more thorough analysis. Seed funding accounted for the 40% of Q1 and Q2 activities, followed closely by venture capital (32%). 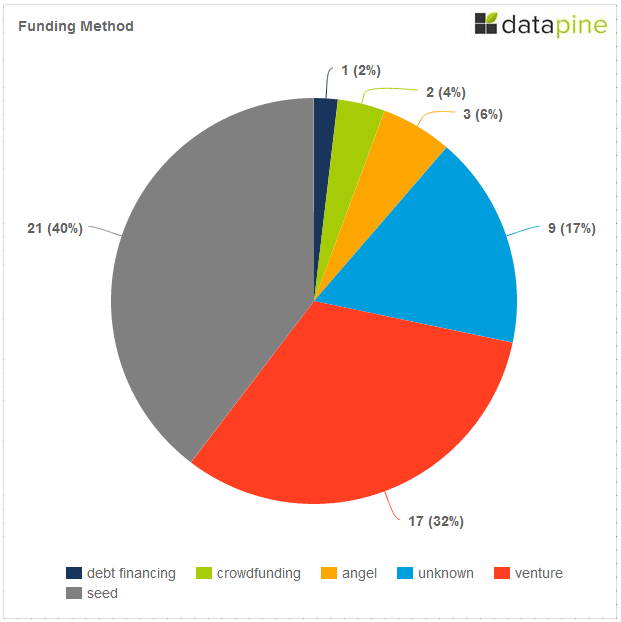 Nine companies did not disclose their funding method; three companies raised from angel investors, two companies crowdfunded, and one company received debt financing via convertible note. The real cash, as you might expect, comes from VC’s. Seventeen Berlin companies announced securing venture capital, and of those, fourteen disclosed numbers. 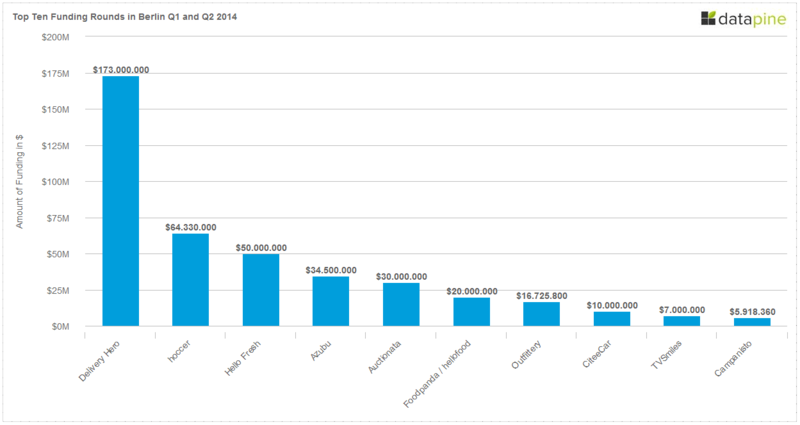 Those fourteen raised an average of $22.7M from venture capital in Q1 and Q2. This number, of course, is an average, which is considerably higher than the median amount, thanks to Delivery Hero’s Q1 $88M round, and Q2 $85M dollar round. The median was under $10M, and when we remove the outliers, the average is $12.1M. Only two companies crowdfunded; Panono, a hardware startup that created a throwable ball camera armed with 36 tiny lenses, raised $1.25M surpassing their $900,000 goal on Indiegogo. Pockethernet, the swiss army knife for network administrators raised $185,433 via Indiegogo. Out of the twenty-one companies that raised a seed round, only thirteen disclosed actual numbers. 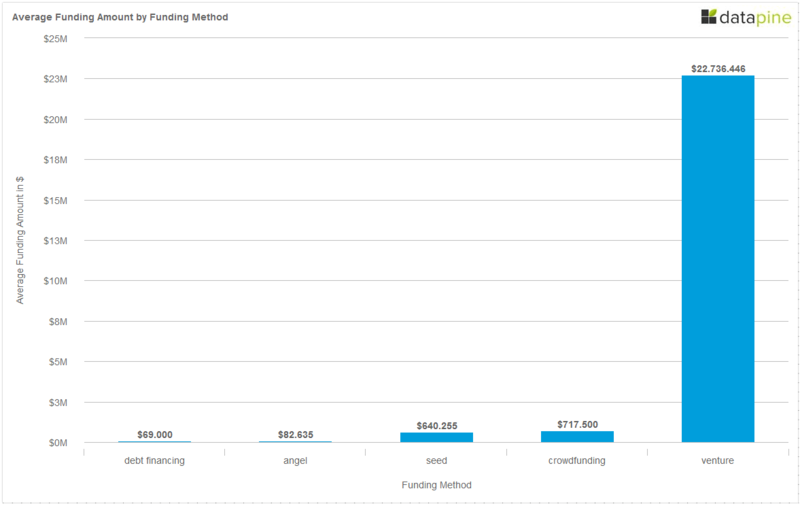 The average seed round of those thirteen startups was $640,255. Seventeen companies raised venture capital funding, but three did not identify a specific round. Of the fourteen companies that did, eight raised Series A for an average of $3.5M. Two raised series B for an average of $23.3M. Foodpanda raised series C for an at $20M. Hello Fresh closed a Series D round at $50M and Delivery Hero raised a series D for $88M, and then a Series F for $85M. Obviously, there is only a solid sample size for Series A averages, but we hope that as the year goes on, there will be more Series B-F data for analysis. Delivery Hero was Berlin’s wunderkinder for Q1 and Q2. They have raised around $285M since 2011, and raised both series E for $88M in Q1, and then Series F for $85M in Q2. The Series E funding was led by new investor Insight Venture Partners, while the Series F lead was not disclosed. TechCrunch speculates that the lead investor was Luxor Capital Group. Other investors include Insight Venture Partners, Kite Ventures, Phenomen Ventures, Ru-net, Kreos Capital, Team Europe, WestTech Ventures, Point Nine and Tengelmann Ventures. Hoccer, a WhatsApp competitor, raised $64.3M led by Dirk Stroer, founder and CEO of Media Ventures GmbH in Cologne. HelloFresh, a grocery-delivery service, secured $50M in Series D funding led by Insight Venture Partners. Azubu, a global broadcast network delivering premium live and on-demand eSports programming, secured $34.5M in funding from the Sapinda Group. Foodpanda, Rocket Internet’s competitor to Delivery Hero, raised $20M in a Series C round from investors including Phenomen Ventures. Oufittery closed a $16,725,800 series B round led by US-based VC Highland Capital Partners. Existing investors Holtzbrinck Ventures, Mangrove Capital Partners, High-Tech Gründerfonds, RI Digital Ventures and IBB Beteiligungsgesellschaft’s VC fund, Kreativwirtschaft Berlin, also contributed. CitteeCar, a car sharing platform, raised $10M in Series A in a round led by Mangrove Capital Partners. TVSmiles, with an app-based loyalty program that provides incentives for watching ads, secured $7M in Series A funding from prior investors Ventech. Rounding out the top ten is Campanisto, a crowdfunding platform, which raised $5.9M in Q1. While Q1 and Q2 were significant, Q3 is heating up nicely with some familiar faces from the first half of the year. FoodPanda secured another $60M in funding earlier this month. Delivery Hero announced the acquisition of Pizza.de, another German based competitor, causing speculation that the total valuation of Delivery Hero is now over $1 billion. The future is bright and getting brighter. Our projection, from available data, is that 2014 investment will beat last year’s funding by a significant margin. Interested in our dashboards? Sign up for datapine’s fourteen day free trial. 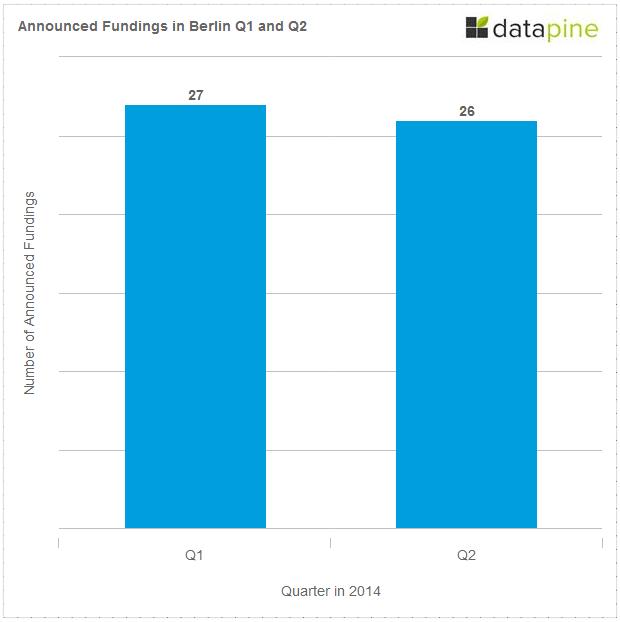 Stay tuned for our Berlin Q3 Funding Roundup. Again, if we missed something, please let us know at Kalie@datapine.com.